The end of the year is always a good time to reflect, look ahead and say thanks. I just returned from another great summit of Vinson Massif in Antarctica with guide Jason Tanguay and seven climbers. 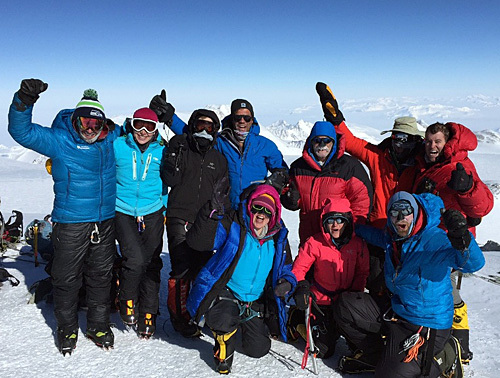 Four of the climbers with us were completing the Seven Summits. Three had climbed Everest with IMG in 2004 and another is going with us in 2006. Congratulations, you guys. Two additional IMG groups flew in as we were on our way off the Ice. Dave Hahn and Justin Merle had one team and Charley Mace had a two person private with him. All flew on and off the Ice on schedule and each team was able to summit. Nice. Another highlight of 2005 was our first trip to Bhutan. 150 miles of beautiful trekking. What a country! Why not join us now before more trekkers discover the country? We're heading back in the fall of 2006. The 2005 trip was made extra special because my wife, Sue, was able to join me. Then, we were joined by Nawang Gombu. I first became friends with Gombu in 1971 and we've been on many trips together since. Check your Everest history books. Gombu's name will fill several pages. He's best known in America as the rope mate of Jim Whittaker in 1963. He climbed again two years later, becoming the first man in history to climb Everest twice. And, that's only a small piece of Gombu's mountain resume. Add to this an incredible group of trekkers and you have the ingredients for a sensational two weeks of trekking. On a sad note, I want to say good-bye to a friend and customer, Rick Buckley. 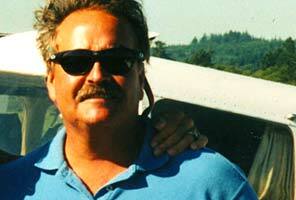 I had the pleasure of climbing Rainier in July 2004 with Rick and his girlfriend, Jill Jones. A serious illness caught up with Rick shortly afterwards and he passed away in early 2005. Adios, Rick. Thanks for sharing the mountains with us. We have another year full of great climbs planned. IMG is proud of the guide staff we have and know that you'll enjoy their leadership. Carpe diem. Join us in 2006. Whether it's a training seminar on Mt. Adams, a trek to Bhutan, spending Thanksgiving in Antarctica or standing on the top of the world, we're going. 2005 has been a good year for me. The expeditions that I organized on Kili, Everest, and Cho Oyu were safe and successful, and our customers were happy. That's what it's all about! 2005 was also the year that Mt. 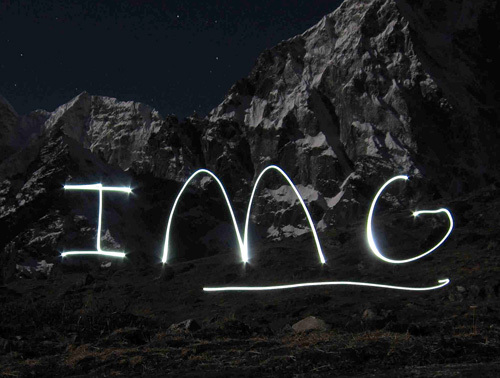 Rainier Alpine Guides, owned separately by Paul Baugher and me, officially became part of IMG. The result is that my longtime partners Phil, George, and Paul are all working together now, and for me seeing this business come together was very exciting. We each bring something very different to the mix and together we are a very strong partnership. Our underlying friendship and respect for each other and our customers makes it much more than "just business" for us. This is what we have chosen to do with our lives, and we intend to do it the best we can. On the domestic front, my wife Erin has brought her considerable skills in business and accounting to IMG this past year to whip us into better administrative shape, and the company is now running smoother than ever. At home, our 5 year old daughter Audrey is skiing up a storm these days, and is already talking about climbing Mt. Rainier with daddy! When I first climbed Rainier back in 1970 as a 15 year old I could have never imagined what a journey was ahead. It has been pretty darn interesting  thanks for being a part of it! What an interesting and eventful year! It certainly didn't lack for exciting climbing opportunities. 2005 was filled to overflowing with great climbs and experiences. This year's highlights include the first guided attempt on the North Ridge of University Peak in Alaska, a month of guiding in the Alps of France and Switzerland, my first trip to Kilimanjaro, Africa and most recently a successful private IMG expedition to Ama Dablam in Nepal. I continue to spend considerable time guiding here in the States, and enjoyed trips to Ouray Colorado, Mt. Whitney in California and Mt. Adams and Mt. Shuksan here in Washington State. As always, a heartfelt thank you to all my friends, old and new, who participated in adventures with me during the past year. 2005 was the year that Phil and I finally said goodbye to Rainier Mountaineering, and hello to Mount Rainier Alpine Guides. It was time to go our own way and complete the union of Mount Rainier Alpine Guides and International Mountain Guides. We welcome the new association which brings long time friend Paul Baugher into the IMG partnership. With partners like Eric, Phil and now Paul, I feel incredibly positive about the long term future for International Mountain Guides. I am enjoying the start of 2006 here in Washington State on "house arrest" with my wife Nancy and growing boys Jimmy (15) and Jeremy (11). I'm recharging and looking forward to 2006 with lots of plans for great trips to the mountains. I hope you can join me in 2006! 2005 was a year of challenges and great rewards. The lack of snow and warm temperatures made winter difficult yet we still ran a number of successful avalanche training sessions. We ran the chairlift at Crystal Mountain when the ski area was closed for our leader training course with the Mountaineers. We also had an outstanding Level III field session with North Cascades Heli-Skiing on the Silverstar glacier. Training with interesting students and fellow instructor and IMG guide, Randy Sackett, made the program very rewarding. By spring, the emphasis had shifted to guide training on Mt Rainier and preparations for the climbing season. Numerous consulting projects and risk management investigations filled the year. One very crucial case in Oregon resulted in a lengthy civil trial. The hard-won defense verdict was a good result for the entire ski and snowboard manufacturing industry. At the end of October, I coordinated the National Avalanche School in Snowbird, Utah. That was a 5 day classroom session that will be followed this winter with a 4 day field session. With over 190 students and 17 instructors, it was a great event and a lot of work. It is a real honor to work with such great people. Within two days of returning from Utah I was surprised to find ourselves in a storm that would allow us to open the Crystal Mountain ski area. It's been a busy roller coaster winter ever since. By far the most rewarding development of the year was Eric and I bringing Mount Rainier Alpine Guides into the International Mountain Guides team. Joining longtime friends Phil and Geo in a great guide service has been exciting. I am anxiously looking forward to 2006 and continuing with our efforts to become one of the new concessionaires on Mt. Rainier. Three IMG teams went to Aconcagua in 2005 and three teams saw the summit. Aconcagua is still one very physical climb. Summit day is at least as demanding as summit day on McKinley. You can't get higher without leaving this hemisphere. Craig John, Lindsay Reither and Chris Bamer worked with the January team. John Race and Olivia Cussen took a private group up in late January. Then, I went down with Romulo Cardenas and our final team in February. The weather was reasonable for each team. My hat is off to anyone who summits Aconcagua. We'll send two groups down in 2006. The January team will approach via the Guanacos Valley and the February team via the Vacas and Relinchos Valleys. Congrations to our January 2005 team  Adam Nappi, Al Chambard, Dan Barter, Erin Bell, John Green, John Kyle, Sheila Howard and Wendy Booker. Congratulations to our January private group  Kim and Reidun Lundgren, Tor Lundgren, Rusty Williams and Jan Williams. Congratulations to our February team  Trent Carey, Stuart Fleming, Mark Damm, Clint Allen, Michael Eeckhout, David Triplett and Rick Lundberg. Ouray is the most fun you can hope to have in the winter. The programs are equally as enjoyable for repeat climbers as they are for absolute novices. I go to Ouray every year because it is hands down the best ice training area anywhere, we get to stay in a comfortable motel with a hot tub, and Ouray boasts a beautiful little town with enough good restaurants to provide a different one for each night in which to swap stories about our day's exciting adventures. Dec. 27-29 Ouray private  Nick and Alexander Subashi, guide Ben Marshall. Jan. 10-14 Ouray Veterans Program  Guy Orangio, Dan Nemoto, Marc Sargis, James Ries, Stacey Ries, Nola Royce, Robert Austin, David Thompson. Guides Jeff Ward, Chris Booher, Matt Farmer, Ben Marshall. Jan. 17-18 Ouray private  Cindy Williams, guide Jeff Ward. Jan. 19-23 Ouray private  Ken Klug, Jay Riley, Josh Knox, Thomas "TJ" Johnson. Guides George Dunn, Ben Marshall. 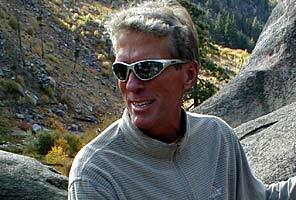 Jan. 19-20 Ouray private  Bob La Rock, Beth La Rock, guide Jeff Ward. Jan. 21-23 Ouray 3-day Seminar  Bob La Rock, Beth La Rock, Andres De Lasa, Rob Showers , Peter Ziolkowski. Guides Jeff Ward, Jake Norton. Jan. 24-28 Ouray 5-day Seminar  Skip Reindollar, Chris Wylocki, Timmy Wylocki, Rodrigo Montanez, Stephen Maxwell, Simon Chan. Guides George Dunn, Jeff Ward, Ben Marshal . Jan. 29-31 Ouray 3-day Seminar  Dale Schmidt, Benjamin Schmidt, Joshua Schmidt, Alan Cook, Ram Iyer Guides George Dunn, Ben Marshall. 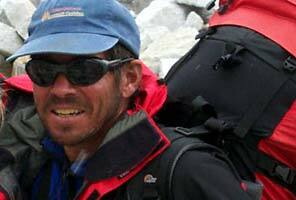 Feb. 4-6 Ouray 3-day Seminar  Brian Hall, Chris Lane,Ted Hedberg, Marc Sargis and daughters. Guides Jake Norton, Ben Marshall. Feb. 7-11 Ouray 5-day Seminar  Mark Wippich , Bobby Green , Rex Schaberg, Kirk Allen, Colin Bailey. Guides Jake Norton, Ben Marshall, Matt Farmer. Our great Ecuadorian partner, Romulo Cardenas, worked with me on a very successful trip in January 2005. Julian Larea and Jorge Anhalzer provided their assistance, as usual. Why more Americans don't visit Ecuador is still a mystery to me. The combination of fun climbs, altitude and the beauty of this country shouldn't be missed. Check out the Trip Report for details and photos. Our January 2006 has been full and overflowing for months. Sign up early for 2007. Congratulations to our January team  David Golden, Cynthia Dodson, John Dean, Robert Alger, Robert Fickman, Steve Sletner, Steve Weiss and Sue Kennedy. 2005 completes our 17th year of conducting Kilimanjaro programs and this was indeed our best year yet. Ten groups went to Kilimanjaro with us in 2005 and all 10 were successful. In fact, we haven't missed the summit since we ran our first program in 1989. This year, George, Eric and Phil each guided one of the expeditions. One of the unique aspects of our programs is that an IMG Senior Guide leads each and every trip. That IMG lead guide works with our dependable Chagga team to provide our customers with a great climbing experience. Another important aspect of the IMG Kilimanjaro Expedition is that we take a full 7 days for the climb. This insures that each climber has a good opportunity to acclimate. And, by having a short day to high camp, it allows us to pack, rest, hydrate and prepare for the summit morning. After a great climb, it's time for a great safari. Most of our customers feel that three days on safari is just about right. And, flying out to the Serengeti to begin the safari really shortens up the driving time and it allows everyone to get a good overview of the area. What a great way to start. We feel we now have just the right mix to make the IMG Kilimanjaro expeditions a great climbing vacation. Many of our customers come as individuals but a large number travel with a spouse, friend or relative. In fact, several organize their own expeditions for a group of family or friends and pick the date which best suits their needs. After climbing Kilimanjaro, give some thought to another climb or trek. Our new Machu Picchu trek is sweet. Or, how about the Himalayas? Regardless, pick one and join us. We had another great year on Everest, with groups on both the North and South Side of the mountain. 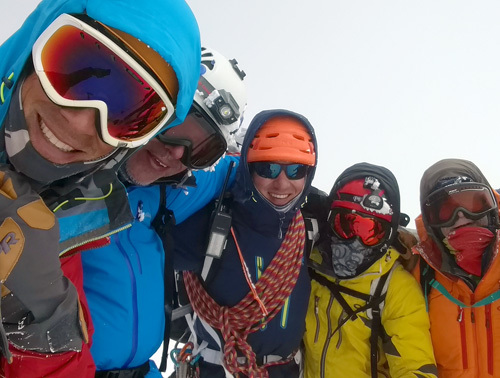 On the South Side, Expedition leaders Mark Tucker and Ang Jangbu Sherpa coordinated a successful trip that saw 16 climbers reach the summit on three separate days, despite the fact that it was a "difficult weather season". In addition, guides Mike Hamill, Walter Laserer and Dave Hahn led custom groups and we were joined by a group of climbers from National University of Singapore, for which we did a custom logistics package in support of their successful ascent. In addition, our Everest climbers were accompanied to Base Camp by several trekkers, Island Peak climbers, and Khumbu Icefall climbers (who also went to Island Peak for acclimatization). Everyone stayed three nights together at Base Camp and celebrated the expedition puja ceremony with the climbers and Sherpasthe traditional "kick off" to the expedition. 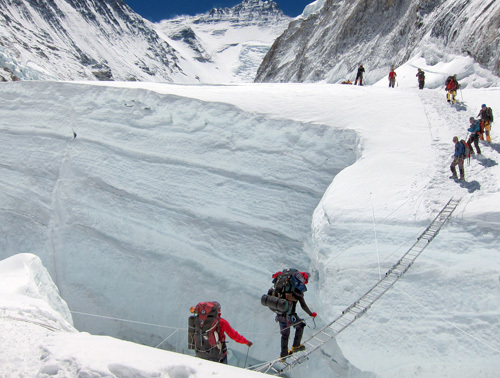 On the North Side, guide Justin Merle led a very successful trek to Advanced Base Camp (21,500 feet). The group came in via Beijing, traveled to Lhasa, crossed Tibet, and walked starting in Tingri all the way to Rongbuk Base Camp and all the way up to ABC. Everest ABC on the Tibet side is the highest point in the world that can be reached non-technically by fit hikers. This is the most strenuous and adventurous non-technical program that we offer. Congrats to Tibet ABC Trekkers: Al DiOrio, Linda DiOrio, Chip Johnson, Ed Cebulko, Chris Searl, and Justin Merle. Whitney via the Mountaineer's Route is a great climb. I really enjoy the entire experience from flying in to Las Vegas, the picturesque drive across the desert and the quaint town of Lone Pine. Allowing four days for the climb makes it pretty doable for the average climber. We normally count on good, sunny weather, good snow coverage and a fun, steep snow climb. The guides teach everyone how to use mechanical ascenders, and we use them as a backup on the final 3 rope lengths to the summit. I'll be guiding the first and third Whitney programs again in 2006! 2005 was the worst year on record weather wise with the big dump of snow the Eastern Sierra got. Our success rate was down to around 50% but all of the climbs got high on the mountain, all but one to 14,000 feet! The weather on Whitney is usually pretty good the scenery is always breathtaking. This program is contracted with Sierra Mountaineering International, who guides under permit in Inyo National Forest. March 26-29  Jill Jones, Wynne Tynes, John Haines, Josh Haines, Patty Mack, Bavesh Patel. Guides Chris Ecklund and Bernd Zuegswetter. April 1-4  Chris Ross, Jonathan Mirsky, Katie Nazzaro, Kevin Moss, Emilie Cortes, Ken Klug, Guides Chris Ecklund and George Dunn. April 3-6  William Tomaszewski , Andrei Paraschivescu, Alex Brockmann, Kerry Fitzpatrick, Mike Claes, Mike Williamson. Guides Anne Keller, Ann Mellick and Kurt Wedberg. April 7-10  Tim Jones, Nicholas Mullan, Ed McCord, Craig Fontaine. Guides George Dunn and Anne Keller. April 9-12  Dan Jones, Jane Jones, Spencer Jones, Tom Hartley, Tom Aikman, Laura Van Puymbrouck. Guides Ann Mellick and Lee Frees. April 17-20  Paul Greenberg, Shamus McGroarty, Lew Miller, David Minninger, Mike Hoffman. Guides Chris Ecklund, Deb Leyh. Wrangell St. Elias is a destination I keep on my personal to-do list every year. There is just so much great climbing to be had, and such a magnificent area, I'll be back for years to come. We attempted a rare climb of the North Ridge of University Peak in May of 2005 with a great team. Persistent avalanche conditions kept us from summiting the peak, but it did not keep us from completing an outstanding 9 pitch ice climb on the other side of the basin we were in. All members of the team completed this ascent, one of the longer ice routes I've ever tried to guide. May 15-26 University Peak, Skip Reindollar, Robert Austin, Josh Knox, Thomas Johnson, Ken Klug, Marilyn Geninatti. Guides George Dunn, Ben Marshall, Peter Brosseau. As we welcome in the New Year, we are happy to report that the 2005 season was another great success. 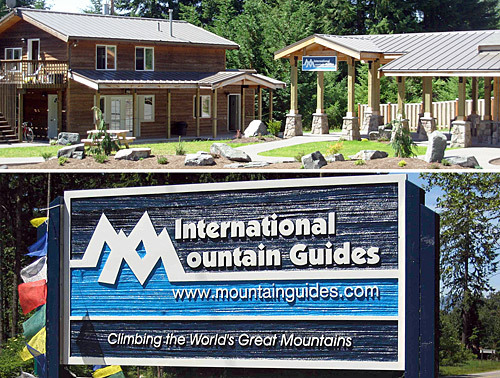 The big news was that Mount Rainier Alpine Guides (previously owed by Eric Simonson and Paul Baugher) has become a wholly owned subsidiary of International Mountain Guides. This added the powerful climbing resumes of the IMG guide staff and of course the management expertise of IMG program directors George Dunn and Phil Ershler. Our 2005 season got underway in late May with our guide training and mini-circumnavigation program, led by George Dunn and Chris Booher. This technical program teaches the latest in climbing and guiding techniques. Little Tahoma and the Ingraham glacier made for a great classroom. Additionally, George, a certified Leave No Trace instructor, taught our LNT Trainer Course for our staff. Our annual expedition circumnavigation around Mount Rainier took place in mid June. This program was pioneered by Eric and Paul back in 1997 and continues to be one of the most difficult alpine programs we offer. The 2005 team had an especially challenging trip with bad weather, avalanche conditions, and heavy packs. Congratulations to that tough team: Anne Keller, Mason Stafford, Peter Brosseau, Donald Summers, Daisy Stephenson, Rachel Schulman, James Causey, and Ken Klug. 2006 will likely be the last opportunity that we will have to conduct this program, since the Park Service is removing the entire West Side of the Mountain from the category of commercial use in the future. If you want to join us for what will be a memorable finale, get in touch! Our Five Day Emmons summit climbs were again conducted with great teams. The two-to-one guide ratio and the training/check out day at the Crystal Mountain Alpine Inn continue to make this a very popular way to climb Mt Rainier. Our season began in early June with a successful climb led by George Dunn. Congrats to our June 4 Emmons team  George Dunn, Anne Keller, Mason Stafford, Peter Brosseau, Ray Raymer, Michelle Pierotti, Chad Pierotti, Donald Wheeler, Donald Souers, John Delury, Gary Lavinder, and John Gorkowski. The June 19 Emmons climb was dedicated to the Washington National Park Fund. Eric Simonson and George Dunn led the climbing team which included a number of distinguished clients who joining IMG in supporting the WNPF. John Kircher, Crystal Mountain Ski Area owner and climbing team member, hosted a special pre-climb dinner at the Alpine Inn. The group departed the next day into blue skies and great climbing weather. Together our team raised over $35K to benefit the WNPF. Jordan Roderick, WNPF board and climbing team member, said these funds are used by the national parks to sustain a variety of programs that would not otherwise be offered. Congrats to the June 19 Emmons group  George Dunn, Eric Simonson, Anne Keller, Eric Stevenson, Jon Evans, Bill Gossman, Larry Huntington, Jordan Roderick, John Kircher, and Kimberly Huleen. In keeping with the theme of benefiting the Park Service, the July 10 Emmons climb saw guides and climbers involved in support of the Camp Schurman climbing rangers with a rescue of a group of independent climbers. Unfortunately this rescue precluded the group reaching the summit, however everyone made it down safely. Thanks to the July 10 Emmons team for their great job  George Dunn, Phil Ershler, Anne Keller, Eric Stevenson, Jason Tanguay, Ang Dorje Sherpa, Daryl McDonald, Mark Dreyfus, Laurence Statman, Takashi Kishimoto, John McHale, and Geriann Siebert. Finally, Our August team was successful. Congrats to the August 7 team  Peter Brosseau, Adam Angel, Jason Tanguay, Ang Dorje Sherpa, Bill Montgomery, Glen Wright, Sherri Wright, Gary Engle, Sydney Engle, David Paxton, Michael Paxton, and Bob Haugh. We are looking forward to the 2006 season. 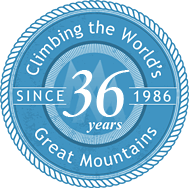 Our Emmons climbs are all filled but we still have space remaining for the Circumnavigation and Guide Training programs. For more information please check out the web site at www.rainierguides.com. 2006 will be our 9th season operating as an Incidental Business Permittee on Mt. Rainier. We expect that any time now the Park service will have issued the bid prospectuses for the long awaited additional concessions for commercial guiding. We are also very optimistic that in 2007 we will be able to offer a greater variety and number of climbing opportunities on the mountain we all call home. We hope to share another trip in the mountains with you soon. Have a safe and happy new year! One of my new "all time favorite" trips. I love the north side of Mt. Adams and the awesome training available within easy reach from camp. The climb of the North Ridge is a fun one too. All in all, a great trip. June 27-July 1 Mt. Adams  Andrew Schildiner, Doug Mullins, Matt Bocek, Jose Santos, Celio Biering, Leah Wicks, Aili Farquhar . Guides George Dunn, Kevin Slotterbeck, Olivia Cussen. The North Cascades has the finest concentration of alpine climbing that you'll find anywhere. Period. I enjoyed upgrading this program in 2005 and we got off to a great start. Whether you sign up for a regular Mt. Shuksan program, or opt for your own private program, there are endless opportunities for great climbing and adventure. 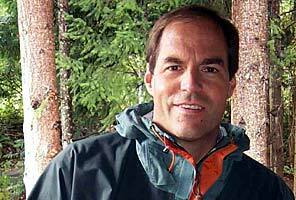 August 8-12 Private, North Cascades  Steve Percifield and Matthew Jones, guide Matt Farmer. August 16-19 Private, Mt Shuksan  Andy Lundberg, Tim Ames, guide Anne Keller. I always have a great time in the Alps. Always. This year was no exception. Two great groups of people with awesome climbing in some of the world's most picturesque mountains, gourmet food and lodging in story book towns. What more could you ask for? Thanks to both groups on the Classics program this year, you were awesome! July 21-August 1, Alps Classics  Robert Casciato, Michael Casciato, Catherine Hollis, Renee Stevens, Dale Gentle, Robert Stevens, Michael Creamer, Beth Creamer. Guides George Dunn, Jeff Ward, Howie Schwartz. August 3-24 Alps Classics  Laurie Loshaek, George Kasynski, Mark Ursino, Ralph Quade, Chris Lynch, Chris Broyles, Jacqueline Quade. Guides George Dunn, Jeff Ward, Howie Schwartz. The weather continued off and on through August, too snowy on the Matterhorn for an attempt. The Matterhorn team carried on regardless with an impressive set of climbs on neighboring peaks. Nice job team! August 17-24 Matterhorn  Stacey Ries, Mark Ursino, Julie Davidson, Jim Davidson, Charles Garcia, Shun-nan Yang. Guides Jeff Ward, Howie Schwartz, Miles Smart. Go see Russia. We had simply a great time there in 2005. My old friend, Igor Tsarouk, still guides with us on every trip. Igor's a great climber, great guide and a great friend. For the last 15 years, we have brought our groups in through St. Petersburg and out through Moscow. Most other guide services now follow that lead. Why not see as much of Russia as you possibly can during the visit? We set up a tour with an English speaking guide for each trip. The same idea applies once we arrive in the Baksan Valley. There are numerous great places to hike and great areas to train. We've always been able to include a good day of ice climbing practice prior to our ascent of Elbrus. The biggest news for 2005 and going forward is that Igor built a new hut on Elbrus. What a difference! Since the old Pruitt burned down several years ago, there really hasn't been a good place to sleep high on the mountain prior to the summit day. That's over now. Now, every other guide service rents the hut when an IMG group isn't there. Best part, we always have right of first refusal. Thanks, Igor. Great job. In 2005, we climbed in great weather and great conditions. Every team member stood on the summit. And, what a team it was. Congrats to Jeff Johnson, Mike Lakotish, Rick Etling, Andy Buroker, Steve Wilson, Dave McAvoy, Pat and Beth McCrann, Mike Bellamy Sr., Mike Bellamy Jr., Paul Torrence... a great group of customers. The trip report says it all. 2005 marked the debut of this IMG instant classic. Thanks to the members of the first Machu Picchu trek, and thanks to veteran guide Maximo Henostroza for his capable leadership. I plan to attend this trip in 2006 and am looking forward to it! Machu Picchu August 3-14: Nicole Areson, Carol Hodges, Ed Homan, guide Maximo Henostroza. Alpamayo is a technical and demanding climb at high altitude. It was not in good shape in 2005 and the normal route was threatened by an overhanging cornice. The team wisely backed off but unfortunately didn't have good weather to attempt an alternate climb of neighboring Quitarahu. August 13-28 Alpamayo: Kirk Allen, Joe Coughlin, Andrew Carafelli, Vladimir Grechka. Guides John Race, Maximo Henostroza. We've run fourteen expeditions to Cho Oyu since 1995  we were one of the very first commercial operators on the mountain. For 2005 IMG senior guide Justin Merle returned to the North Side to lead the Cho Oyu expedition in late August because he could not get enough of the blue sky of Tibet (not to mention yak meat and Chinese beer). Cho Oyu is only 20 miles west of Everest and the route to Base Camp leaves off from Tingri, the nearest village on the Lhasa-Kathmandu highway. The Cho Oyu team was joined by Ang Jangbu and his crack Sherpa team, several Tibetan assistants, and several Cho Oyu Trekkers. They had a great trip, with all but one of the climbers reaching the summit. Kudos to Robert Hottentot who at age 65 becomes the oldest American to successfully summit an 8000 meter peak and make it home in one piece! 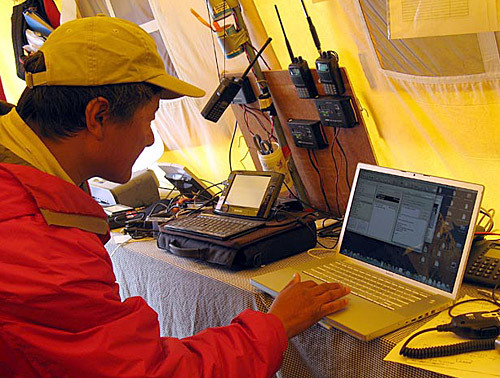 Please see our cybercast of the 2005 Cho Oyu expedition. Joshua Tree is always a great program. You can't find a better rock climbing area in which to learn skills, put in lots of pitches of rock, and climb in a beautiful high desert environment. The perfect fall getaway! October 3-7 Joshua Tree Robert Roos, Amy Roos, Yusuf Osmani, Nadera Osmani, Rodrigo Montanez. Guides Anne Keller, Chris Ecklund. We've run several Ama Dablam trips over the last few years. For Autumn 2005 we had both a guided and a non-guided program. Congrats to our logistics-only crew: Todd Rector, Kim Havell, Jordan Campbell, Lance Waring, Rob Klimek, John Matthews and trekkers Kelly Merck and Karen Parks. George Dunn reports on the guided climb: "Ama Dablam had been on my hit list for several years now. In October 2005 guide Jeff Ward and I were fortunate enough to put together a private group of friends from past trips. The expedition was everything I had hoped it would be, definitely a challenging ascent for all of us. Thanks to everyone for making this the ultimate experience for all of us and a fitting end to a great year. Congrats to the team: Carl Werts, Scott Lefky, Mark Ursino, Marilyn Geninatti, Robin Desota, Pat Luke, and trekkers Lauren Desota and Cameron Ceglia." Mark Tucker and 'Oso' showed our November group around Mexico and then to the summits of both Ixta and Orizaba. If you like sun, cerveza and a bit of climbing thrown in  well, this is the trip. It's great to be able to leave home on a Saturday and be back in your house the following Sunday with two big climbs under your belt. I've been going to Mexico since 197l and still return every chance I get. Almost no other guide service climbs Ixta the way IMG does. We have the Reyes family bring four-wheel drive vehicles from Tlachichuca and take us in the front side of Ixta on old logging roads. By approaching the Ayoloco Glacier this way, we avoid all the crowds and problems which can occur at Paseo de Cortes and La Joya. We normally don't see another soul until high on our summit day. It costs more but is it worth it? You bet. Our relationship with the Reyes family has existed for over 30 years. Do these long term relationships make a difference in the quality of our programs? You bet. And, take a look at the recent trip report on the Mexico page. Congratulations to our November team  George, John and Richard Dolson, Christopher Lane and Ted Hedberg. Another highlight of 2005 was our trek in Bhutan. As I mentioned earlier, it couldn't have gone better. Almost everyone on the team were people we knew well. To say it was a cohesive group would be an understatement. Trips like this remind me of why we entered this business in the first place. And, can you believe that Nawang Gombu joined us for the entire trip! Gombu is 70 and he still is going strong. I want to be just like that when I grow up. Don't we all! We also need to give special recognition to Brooke Meyer. Everyone on the team knows what a great job she did and Sue, Gombu and I couldn't have been happier or more proud of her. Hell of a job, Brooke. We're heading back in 2006. Don't miss out. Sign ups have already begun. Take a look at this trip report. Congratulations to our October team  Brooke Meyers, Sharon Haywood, Catherine Bell, Mary Figge, Cynthia Dodson, David Golden, John and Gerlinde Whetzell, Kim, Reidun and Kari Lundgren, Thomas Wise, Richard Ripple and Kathy Fowler. And, least I forget, Susan Ershler. My guiding year always seems to end on the top of the bottom of the world. Three groups, three summits and everyone in and out exactly on schedule. We're not going to ask for more! It really is hard to describe the entire experience of going to Antarctica and climbing at almost 80 degrees S. latitude. Check out archived updates from the 2005 expedition. Jason Tanguay, IMG guide and Everest summiter, helped me stay out of trouble on our first trip. What a powerhouse team we had. Six of us had been to the top of Everest and a seventh is on his way there this spring. I'll have to admit, it was a bit chilly at Camp 1 this year but the weather gods were kind on our move up high and we were on the summit with almost no wind. I'll take it. Dave Hahn, who has more Everest and Vinson summits than any of us, led our second group accompanied by IMG guide Justin Merle. Justin was fresh from leading our successful Cho Oyu expedition earlier in the fall. Not a bad pair of guides. Dave and team had it a bit tougher at Camp 1 than did we. Not as cold but more issues with the wind. But, we all must have kissed the same blarney stone because they too had the perfect summit day. A little good luck, or is it good timing, never hurts. The very accomplished Charley Mace led a small private group of 2 climbers during the same period of time that Dave was on the Ice. Same weather and the same result. A safe, successful and enjoyable trip. And, everyone was home for the holidays. Don't wait on this one. The price of flights is going up annually. Now is better than later. And, you know where I'll be in November 2006. IMG guides like Dave will likely be there, too. Congratulations to our November team  Kevin Flynn, James Gagne, Dan Barter, Dale Darling, Jordan Roderick, Kent McClelland and Brien Sheedy. Congratulations to our December team  Nancy Norris, William Burd, Carlos Vallejo, Paul Torrence, Steven Maxwell and Ed Diffendal. Congratulations to our December private group  John Lewis and Joshua Visitacion. A heartfelt THANK YOU to everyone who climbing with International Mountain Guides in 2005. Your repeat business is the reason for our success.